PennsylvAsia: "Death and Literature: Time, Sickness, and Writing," November 27 at Pitt. "Death and Literature: Time, Sickness, and Writing," November 27 at Pitt. 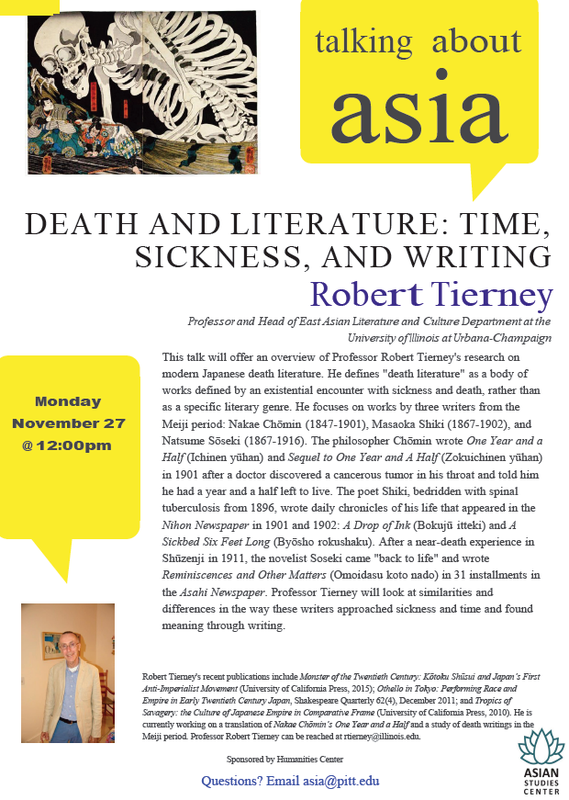 The University of Pittsburgh's Asian Studies Center will host Dr. Robert Tierney and his talk "Death and Literature: Time, Sickness, and Writing" on Monday, November 27. This talk will offer an overview of professor Robert Tierney's research on modern Japanese death literature. He defines "death literature" as a body of works defined by an existential encounter with sickness and death, rather than as a specific literary genre. He focuses on works by three writers from the Meiji period: Nakae Chōmin (1847-1901), Masaoka Shiki (1867-1902), and Natsume Sōseki (1867-1916). The philosopher Chōmin wrote One Year and a Half (Ichinen yūhan), and Sequel to One Year and A Half (Zokuichinen yūhan) in 1901 after a doctor discovered a cancerous tumor in his throat and told him he had a year and a half left to live. The poet Shiki, bedridden with spinal tuberculosis from 1896, wrote daily chronicles of his life that appeared in the Nihon Newspaper in 1901 and 1902: A Drop of Ink (Bokujū itteki) and A Sickbed Six Feet Long (Byōsho rokushaku). After a near-death experience in Shūzenji in 1911, the novelist Soseki came "back to life" and wrote Reminiscences and other matters (Omoidasu koto nado) in 31 installments in the Asahi Newspaper. He will look at similarities and differences in the way these writers approached sickness and time and found meaning through writing.